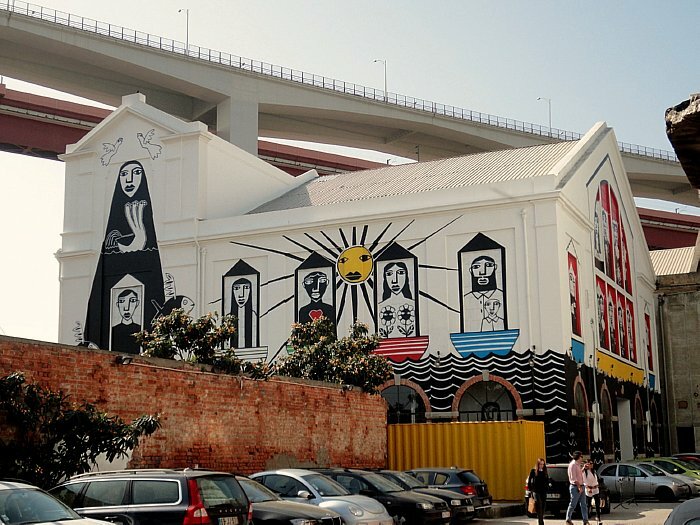 Lisbon and the Sunny Coast: "Espaço Brasil"
To me it has a shape of a church. Second look tell a story about people and boats. Nicely done, and easy to spot. Wonderful windows telling a story. Looks like a church to me, interesting building. At first I thought this was a church with really funky stained-glass windows. Love it! What a great, interesting, different building and colorful indeed!! Wonderful capture for the day! Hope your week is off to a great start, Jose!! Enjoy the moment! It seems that everything I see about Brazil is too cool. I like it. Gives the building a real character. I bet it stands out in Lisbon! What a wonderful building! You captured it beautifully! Wow - I love that so much, JM! An impressive building. It does remind me of a church. I would expect something more colorful, but its not bad at all! Love the way the building is painted. The restricted range of colors really works well on the white canvas of the building. Oops, forgot to say: Thanks for contributing to this week's Monday Mural. Really? In Lisbon? I got a good laugh out of the two strategically placed flowers in the picture of the woman. Thnank you..this very interesting and good job for you.c. Nice post Thanks For Sharing :) It seems that everything I see about Brazil is too cool. . . . . . . . . . . . . . . . . . . .